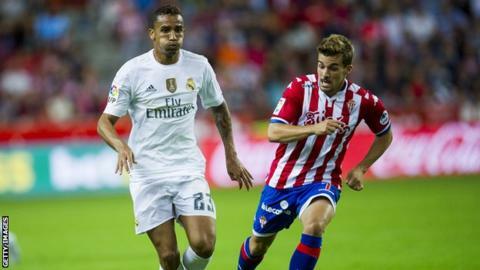 Manchester City are expected to complete the £26.5m signing of Real Madrid defender Danilo within the next 48 hours. Real coach Zinedine Zidane said the 26-year-old Brazilian has left the club's training base in Los Angeles to have a City medical. It is understood the medical is yet to take place and no deal has been signed. With City also in LA before their match with Real on Wednesday, it is expected the deal will be completed quickly. It means [Only registered and activated users can see links. ] as outlined by City manager Pep Guardiola on Thursday. Roma are also in the United States and play Tottenham in New Jersey on Tuesday. Brazil international Danilo joined Real in 2015 from Porto but started just 17 La Liga games last season. He can play at both right-back and left-back as well as in midfield. In two years at the Bernabeu, Danilo won La Liga, two Champions Leagues, the Uefa Super Cup and the Fifa Club World Cup. Two right backs as also got walker or can he also play left back ?